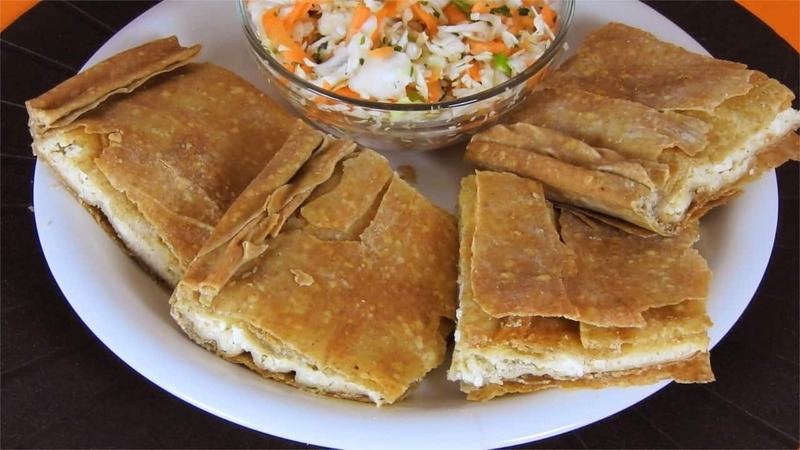 A delicious version of the classic Greek cheese pie, enriched with tahini and wrapped in homemade whole wheat phyllo. Combine it with a nice fresh salad and enjoy! In a mixing bowl combine feta, milk, eggs & tahini. Brush a rectangle baking pan with olive oil (38 x 25cm / 14.9” x 9.8”). Using a rolling pin, transfer the first pastry sheet to the prepared pan. Arrange it nicely making sure it covers the sides of the pan. Brush the whole surface with olive oil. Continue with the second pastry sheet. Brush with olive oil. Cover with the third pastry sheet, leaving it like a wrinkled cloth. This way you’re creating air pockets that will make your pie crispier. Brush with olive oil. Spread the filling evenly all over the surface. Cover with the remaining sheets, brushing them with olive oil. Brush the whole surface with olive oil. Fold and pinch the edges to seal the pie. Gently cut the surface into pieces, not all the way through. Bake in a preheated oven, at 180⁰C / 350⁰F, for 45min, until it’s golden brown. Enjoy!